A brand new dining experience has been introduced at Hard Rock Hotel Singapore by Resorts World Sentosa (RWS). 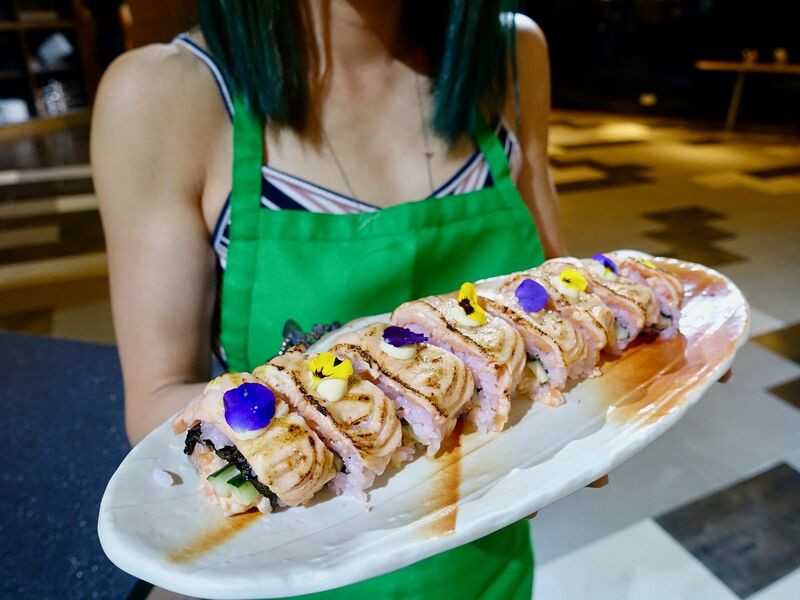 Get your savory, sweet, and Masterchef desires satisfied here with their crab and seafood dishes, elaborate patisserie, and cooking classes with their celebrity chefs. The highlight here is really the cooking studio, named Cooking Sessions. I don't know about you but i absolutely love cooking classes even though i never cook at home. So don't worry if your cooking skills are less than stellar, you'll be under the good hands of the celebrity chef or the resident culinary expert. 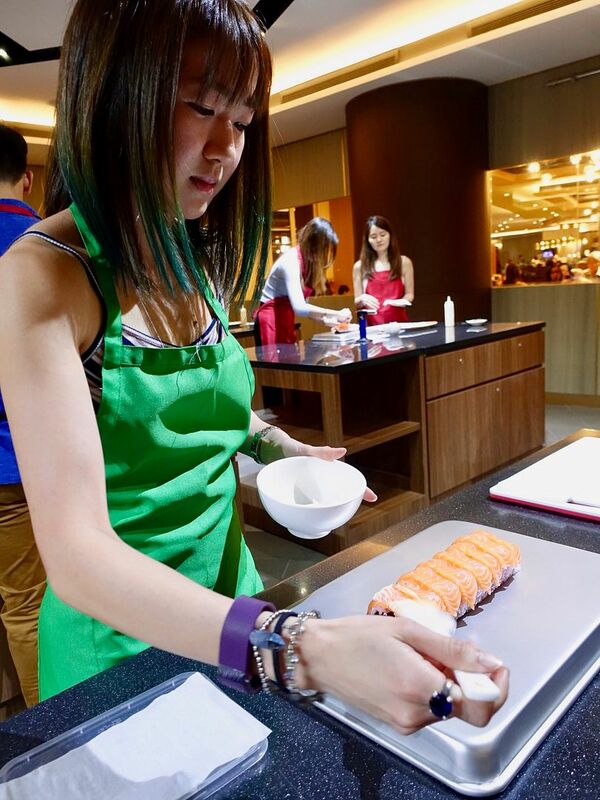 Plus there are a variety of cooking programmes - from decorating cupcakes and baking cookies for the little ones (for children four years old and above at $18 nett per child) to a fine-dining 3-hour multi-course menu cook-off competition which makes for an exciting team-building activity (from $120 nett per person). 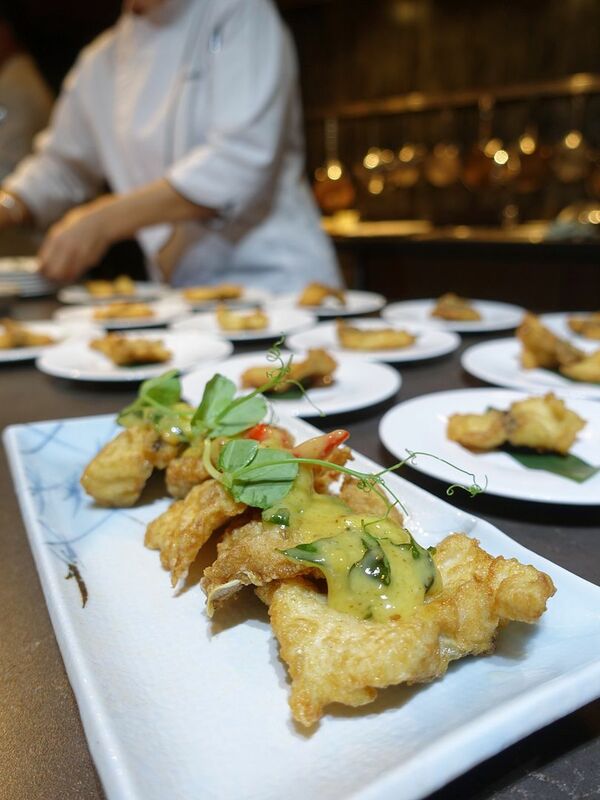 Chef Forest Leong took us through the preparation of her Fried Fish Slices with Salted Egg Yolk Cream which is served at Forest. 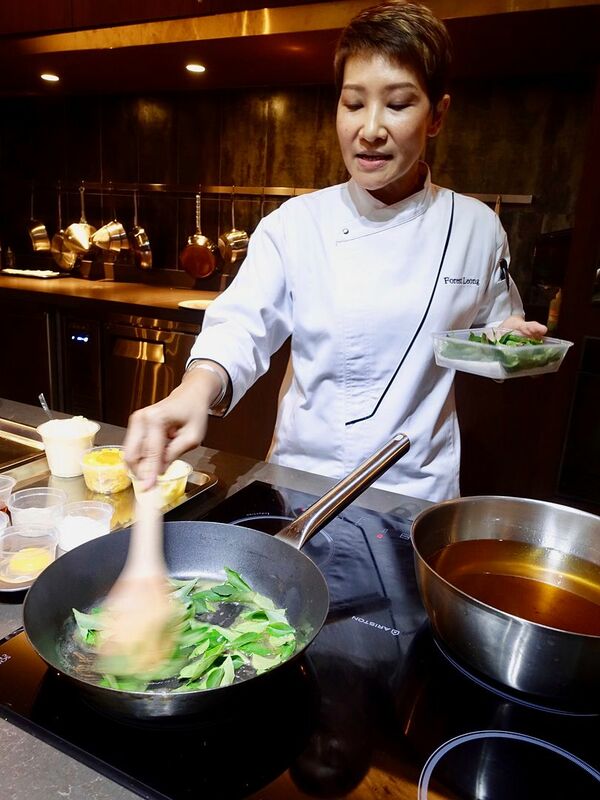 Her husband Chef Sam Leong is one of the instructor chefs at Cooking Sessions, along with Chef Douglas Tay from Osia Steak and Seafood Grill, and Chef Yew Eng Tong from Ocean Restaurant by Cat Cora. We participated in the cook-off programme, which is great for team-building or just a fun time out with friends/family. Each team will learn a specific dish from a professional chef and cook it for the other teams who will grade the taste, presentation and service. 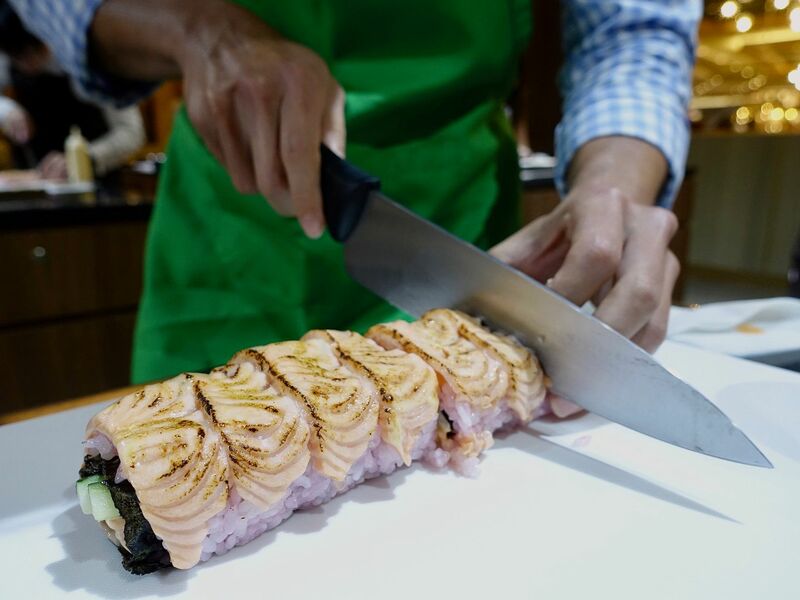 In our competition, each pair had to recreate a Salmon Aburi Roll that RWS Executive Chef Eric Tan made. I ended up doing the pretty things, like placing the salmon and torching them, as well as putting the final touches on the dish. 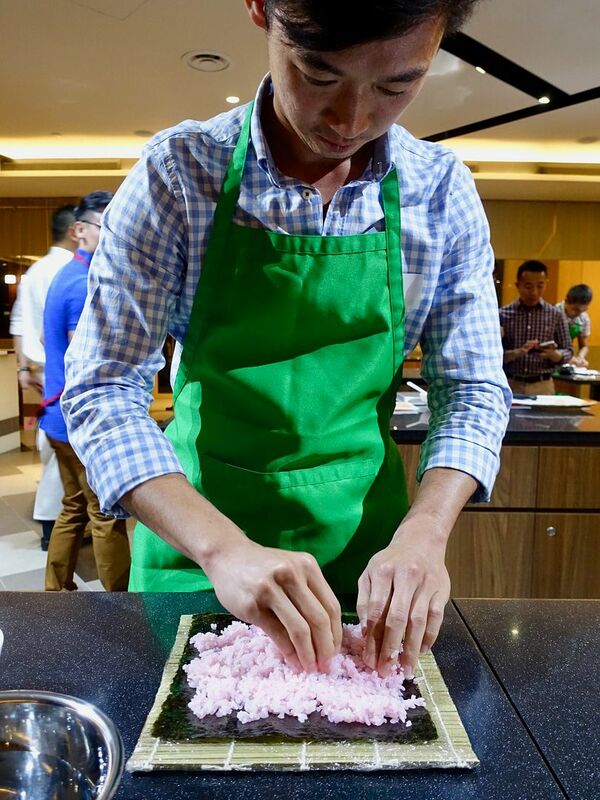 Jr was doing the difficult stuff like rolling the maki, and cutting them. Well well, it's all teamwork still! I was supervising his work heh. Even though our maki was a little bit squashed, it was pretty enough and possibly the best thing that we tasted that night at Sessions. Plus our stellar teamwork won us the Best Team in the competition ;) Check out the rest of the cooking menu and book your sessions at Cooking Sessions. 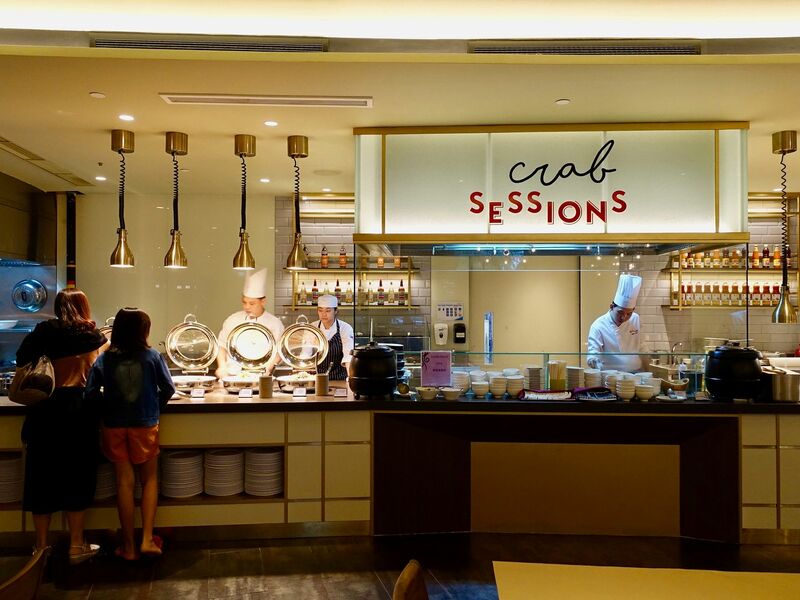 For those preferring to just dig in, you can get your hands on the seafood offering at Sessions’ restaurant section, Crab Sessions. 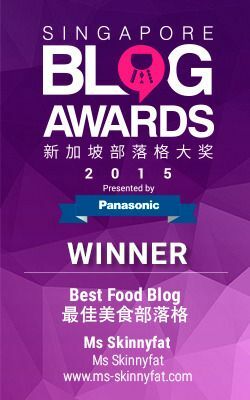 Singaporean favorites like Chili Crab; Black Pepper Crab; Butter Crab; Sambal Squid and Drunken Prawns are available. A limited selection of zi char dishes are also available. You could also have the popular Louisiana Cajun seafood buckets ($125 for 2 to 3/$230 for 4 to 6); Cajun Peel & Eat Prawns with Cocktail Sauce; Grilled Squid drizzled with Lemon Olive Oil; Black Shell Mussels Sautéed with White Wine and Garlic; and Southern Crispy Chicken Wings. You will like Sweet Sessions if you are into OTT, pretend-to-be-in desserts. Bingsu, Rainbow Cake, Melting Chocolate Dome.. Yes they have all of that. 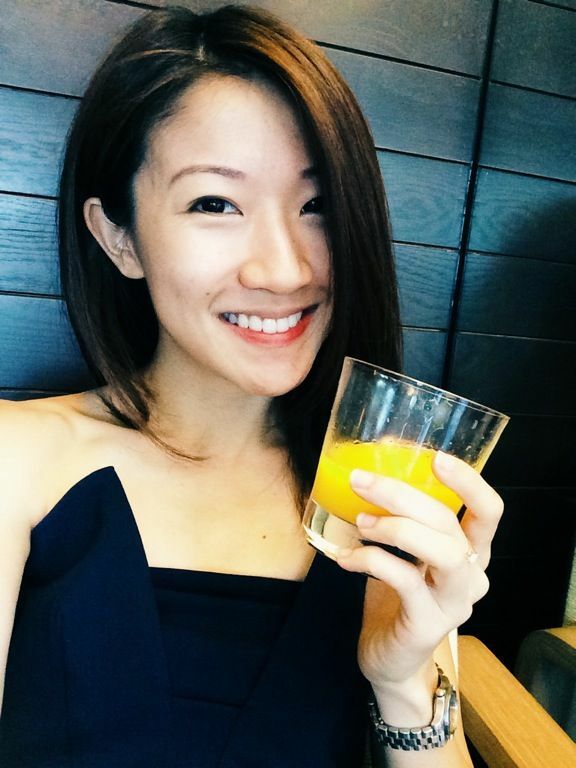 That's not to say that they aren't tasty, after all Sweet Sessions is helmed by award winning RWS Executive Pastry Chef Kenny Kong, who is also the President of the Singapore Pastry Alliance since 2006, and mentor to pastry chefs in Singapore’s national pastry team. 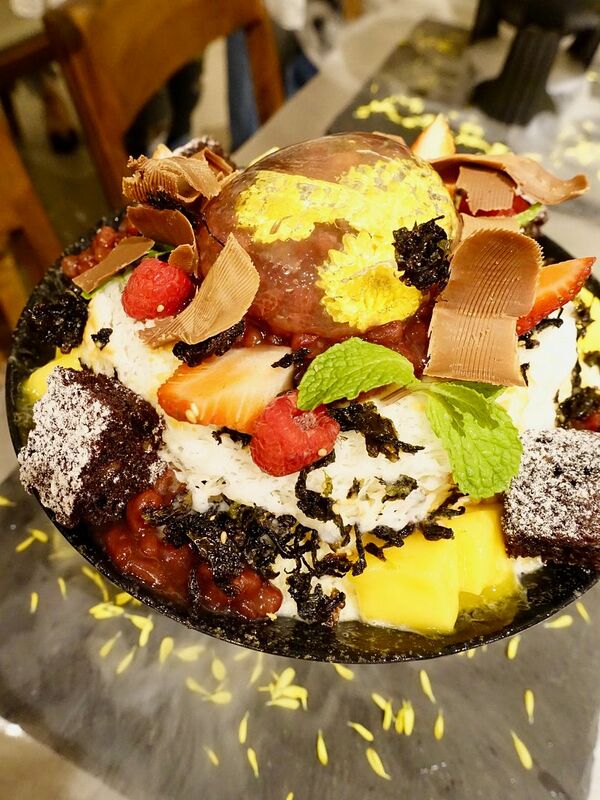 I mean, if i really had to eat a Bingsu, it would be this one. It's a huge bowl for only $20. Plus i really liked that sesame seaweed with brownie rocks. Sessions also had a weekend dinner buffet on Fridays and Saturdays which features a selection of seafood, grilled meats and desserts. 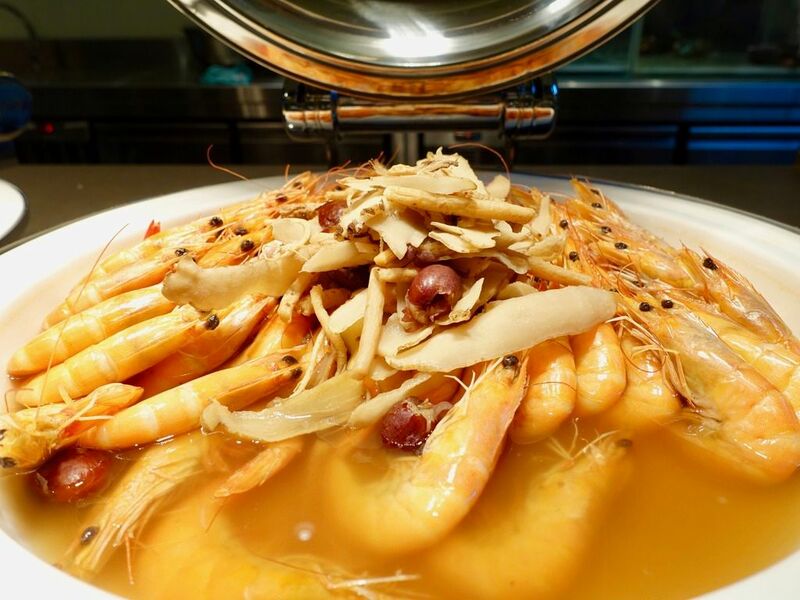 Highlights include Poached Prawns; Louisiana Seafood Gumbo; Grilled Salmon with Citrus Zest; Grilled Rib Eye Steak; Chicken and Chorizo Jambalaya Rice; Chili Crab with Mantou and Black Pepper Crab. The buffet is available at $75/adult or $37.50/child with a free flow of coffee, tea and infused tea. Giveaway! Win a weekend buffet for 2 persons when you participate in my IG giveaway. Lookout for the Sessions post for more details.